Agricultural development is central to addressing some of the biggest challenges today: climate change, hunger, poverty, need for rural employment, and managing access to land and natural resources. According to the World Bank, climate change could push 100 million people into poverty in the next 15 years. Farmers will be the primary victims, affected by reduced rainfall, crop failure, heat waves, and floods. Yet, instead of investing in small-scale farmers, who produce over 70 percent of the food consumed in the world and practice sustainable agriculture, the World Bank’s programs push for a wide adoption of industrial agriculture techniques involving fossil-based chemical inputs, modified seeds etc. 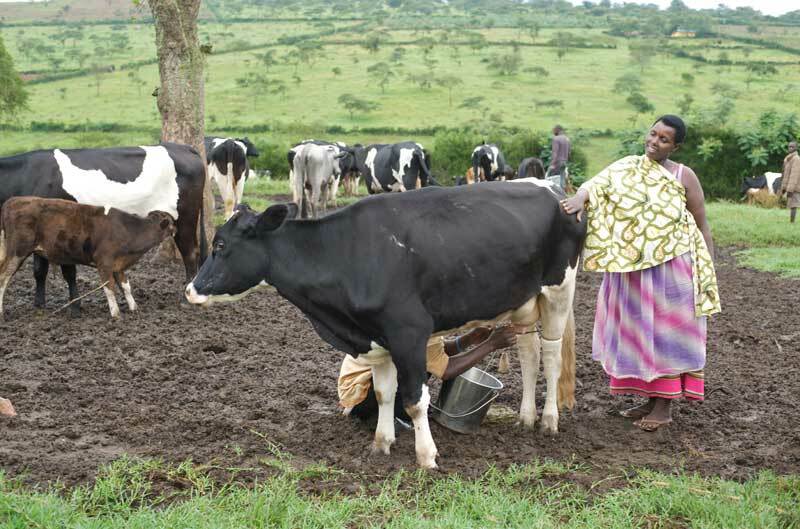 In Rwanda, farmers have successfully organized in cooperatives to sell milk produced in integrated garden-livestock systems. Using the motto “integrating farmers to markets,” the Bank’s agenda supports the interests of large agribusinesses and the producers of agricultural inputs. In conjunction with other actors, such as the Alliance for a Green Revolution in Africa (whose donors include the Bill and Melinda Gates Foundation, DfID, USAID, and others), the Bank has been pushing private sector-oriented agricultural policies onto governments of the developing world. In 2013, the World Bank began developing the Enabling the Business of Agriculture (EBA) indicators: a top-down approach to monitor and influence governments’ “regulations and policies that affect agriculture and agribusiness markets.” In doing so, the EBA overlooks successful existing farmer-centered solutions and, instead, proposes policies that fail to fight climate change1 or protect farmers’ access to land. Recently released 33 cases studies from the Oakland Institute showcase the success of agroecology in Africa, a different way of stimulating agricultural development while addressing global challenges and benefiting farmers. For instance, a case study from Niger features a large land rehabilitation project in the desertification-stricken valley of Keita. Through reforestation interventions, the consolidation of waterways, and sustainable cultivation techniques, the Keita valley woodlands increased by 319 percent between 1984 and 2002, while dunes areas decreased by 33 percent in the same period. The project was credited with sequestering approximately 132,000 tons of CO2 per year. Furthermore, farmers’ yields increased, with cereal production rising from 39,000 to 55,000 tons. Another study from Ethiopia’s Tigray region describes a “low external input” approach based on compost use, land rehabilitation practices, and improved biodiversity. This method allowed for a reduction in chemical fertilizer use by 40 percent, while the region’s grain yields doubled within three years. In addition to improving farmers’ incomes, the project helped combat erosion, improve soil moisture, and preserve Tigray’s water tables. The Oakland Institute released the agroecology case studies two weeks before the COP21 meetings in Paris to highlight the crucial role governments must play in generating efficient climate change interventions while upholding agricultural production. In Tigray, for example, the regional Bureau of Agriculture and Rural Development (BoARD) played a key role in scaling up the low external input approach through its extension services. The BoARD’s involvement allowed the program to reach over 90 communities in 25 districts with some of the most degraded lands. In a study of Malawi and Zambia, governments, research institutes, and international agencies partnered to promote the cultivation of cassava, which requires little water and no chemical inputs. The goal was to reduce farmers’ dependency on maize monocultures and to help mitigate the effects of drought on food security. Astonishing results were achieved, with a three-fold increase in cassava production in Zambia between 1980 and 2001, from 315,000 tons to 950,000 tons, and even greater expansion in Malawi from 144,760 tons in 1990 to 4,813,699 tons in 2013. In contrast, the role of governments under the World Bank’s EBA is mostly that of a “business enabler,” as they adopt market-friendly regulations and attract investors.2 While the Bank argues that “enabling business climates” will allow the private sector to bring solutions to agricultural issues, this approach is unlikely to benefit farmers. As the Oakland Institute’s research demonstrates, strong government involvement and mobilization of agricultural extension services is crucial in building relationships with rural communities and effectively supporting farmers’ livelihoods. In addition, farmer-centered programs reduce public spending, as they build on already existing solutions and do away with expensive subsidies programs for agricultural inputs. Finally, supporting traditional and sustainable farming can preserve water resources, help regenerate soils, and fight soil erosion, leading to long-term yield and income gains. The World Bank believes that the fundamental problem facing smallholders is that they aren’t “meet[ing] their potential” and should therefore shift “from subsistence to commercially viable farms.”3 The case studies show, with a wealth of examples and details, that there are millions of farmers practicing agroecology who are active market players, trading their goods at the local, national, and even international level. In Niger, the sale of cereals, vegetables, livestock, and wood produced using sustainable methods provided additional incomes of over US$15 million per year in the Keita valley region. Through an agroforestry and sustainable agriculture project in Rwanda, farmer cooperatives were created in several districts. Within three years, the cooperatives were selling 1,000 liters of milk daily, at a price a 33 percent higher than ongoing rates. In Zambia, the Community Market for Conservation (COMACO) program developed a network of six Regional Community Trading Centers, which service 75 Community Trading Depots. The centers process, package, and market goods collected in the depots, bringing hundreds of thousands of revenue to local communities every year. These examples, along with many others in agroecology case studies, reveal that the World Bank’s separation of “subsistence” and “commercial” agriculture is false. The Bank’s goal to integrate farmers into global markets is a pretext to promote a model of intensified agricultural production, which has already proven to be hugely destructive. The promotion of agroecology requires political will. Governments have to embrace the complexity of local contexts and natural agro-ecosystems, in order to implement bottom-up policies that place farmers at the center of decision processes. Top-down approaches, which neither acknowledge the complexity of each environment nor engage with farmers, need to be discarded, even if they are backed by billions of dollars of aid. The EBA approach recommends mitigating the impacts of climate change by increasing farmers’ use of commercial seeds and fertilizers, which is supposed to help mitigate the effects of weather variations while scaling-up food production. However, the EBA’s stance is highly problematic since synthetic fertilizers emit greenhouse gasses that, themselves, contribute to worsening climate change. In addition, commercial seeds are standardized for manufacturing purposes and undermine agricultural diversification and biodiversity, both essential to address climate change. For clarity, we should note that the Bank does call governments to invest in the agricultural sector, but this is limited to the financing of transportation, storage, and phytosanitary certification infrastructures, to enable markets and the private sector to flourish. World Bank. Enabling the Business of Agriculture 2015, Progress Report. The World Bank Group, 2014. http://eba.worldbank.org/~/media/GIAWB/AgriBusiness/Documents/Report/Enabling-the-Business-of-Agriculture-2015.pdf (accessed December 7, 2015). See also a critique of the World Bank’s EBA: Martin-Prével, Alice. New Name, Same Game. The World Bank’s Enabling the Business of Agriculture. Oakland Institute, 2015. http://www.oaklandinstitute.org/new-name-same-game-world-banks-enabling-business-agriculture (accessed December 7, 2015).